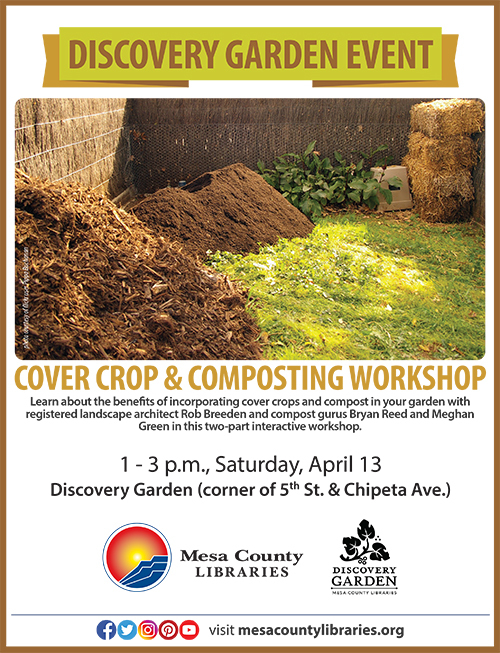 A two-part workshop explaining the use of cover crops and compost in your garden is set for 1 p.m. Saturday, April 13, 2019, in the Mesa County Libraries Discovery Garden, Fifth Street and Chipeta Avenue, Grand Junction. The workshop sessions will be presented by registered landscape architect Rob Breeden, Bryan Reed of the Western Colorado Community College (WCCC) Compost Facility, and Meghan Green of the Colorado Mesa University (CMU) Sustainability Council. The classes will be interactive and will allow participants an opportunity to practice planting cover crops and composting techniques in the Discovery Garden. Attendees are encouraged to bring a chair if they prefer not to stand. The workshop is open to the public at no charge. Cover Crops with Rob Breeden, RLA: 1 p.m. Saturday, April 13 – Learn how cover crops can be utilized to manage soil erosion, soil fertility, water, weeds, pests, diseases, biodiversity, and wildlife. In addition, learn how cover crops can be incorporated into your current gardening practices! Composting with Bryan Reed and Meghan Green: 2 p.m. Saturday, April 13 – Learn how to grow healthy, plentiful garden fruits and vegetables using compost. In this interactive class, learn about the different varieties of compost and why compost is so good for plants, and gain insights into the different stages of compost production. Attendees are encouraged to bring their questions to be answered by a composting guru! The Mesa County Libraries Discovery Garden is a series of interactive and demonstrative gardens that provide education, food, respite, and community engagement. A variety of gardening techniques will be modeled as the garden develops, including xeric, raised bed, in-ground farming, pollinator, and permaculture design. Plans include a variety of demonstration gardens, a children’s garden, community food plots, a pollinator garden, and a compost facility. The Discovery Garden is a space where people can gather for educational programs and events. The Mesa County Libraries Discovery Garden relies on volunteers and is an exciting way for the community to become more involved in gardening and to learn about different gardening techniques and outdoor-related topics.